If you enjoyed the Living in Love e-celebration and want more, you'll find it here. 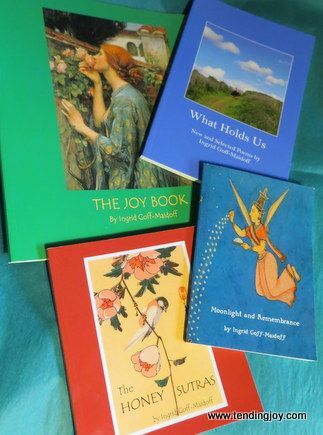 Purchase all four books as a bundle, and save $7.90 This Bundle includes WHAT HOLDS US, THE JOY BOOK, THE HONEY SUTRAS, and MOONLIGHT AND REMEMBRANCE. Each book is signed by Ingrid, if you would like a special inscription, please indicate so on your order form.